Welcome to my next series of posts, which is about all the way stars die. You see, depending on the mass of the star, they can have very different “endings”, sort to speak. So don’t believe anyone who tells you that the sun is going to explode or something like that. It won’t. Instead, something else is going to happen. There are a lot of caveats as to how this works, and as you will see in another post, mass is not the only factor in how a star ends up. Also, each endings have sub endings, the universe is quiet complicated after all. What I will not be going into is the details of the evolution of the stars. Just their deaths. The posts would be really long and meandering with those details included, so I will be very general instead. Believe me, there are a lot of ways stars evolve and the intricacies are enormous. Now that you know what you will be getting, let’s begin. In order to understand how all stars die, one has to understand the inner workings of a star. All stars are fueled by the fusion of atoms in its interior. During their main sequence phase (the relatively stable, long lived part of a star’s life), hydrogens are fused into helium. When it does so, a little bit of the mass of the atoms are converted into light, E=mc^2=pc, Einstein’s famous equation (Wait, pc? What the hell is that, you might be wondering. That may be a topic for another discussion, but the energy due to mass m turns into the energy due to momentum p of light). Incredibly, the sun loses millions of tons every second to this process. And in fact, the mass of the four protons used to produce helium are a little bit more than the mass of helium. During that main sequence period, the thermal and radiation pressure from a star’s interior counterbalances the gravitational force trying to squeeze the star. So long as that hydrogen in the sun’s core keeps fusing, the truce is maintained, and the star keeps chugging along without agitation. But as we all know, resources don’t last forever. What happens when the hydrogen, or at least the really hot hydrogen in the center that are able to fuse runs out, and all that remains are useless helium and hydrogen? That is when all hell breaks loose, and the differing mass of the stars will send them into wildly different paths. One fundamental concept I want to get to before going into what will be the remnants of the dead star is the concept of degenerate matter. Aside from being a really cool sounding word, it is the stuff stars will eventually be made of. They are highly compressed form of matter, squeezed to such an extent that quantum mechanical properties take over classical mechanics. In degenerate matter, pressure does not depend on temperature. What happens instead is that if you dump mass on it, instead of getting bigger, pressure increases and the whole thing becomes smaller and denser. They are strange kinds of matter indeed, and neither solid, liquid, gas, nor plasma quiet describes what this is. It is another state of matter. What causes this phase of matter at extreme high pressure is the fact you can’t just keep squeezing things infinitely without running into a snag, which is the rules of quantum mechanics. In the case of electron degeneracy, it is the fact that electrons have to keep filling lower and lower energy levels. According to the Pauli Exclusion Principle, no electrons shall occupy the same quantum states. So for example, two electrons can’t be in the same energy unless their spin number is different (in quantum mechanics, spins are rotations that look like it exists, but really isn’t there, yeah, it is kind of confusing). Since there are only two spin numbers, positive and negative, if you try to squeeze one more electron into the energy level, the particles will resist the other electron from moving in. That creates the pressure needed to resist the compression. Now, considering the extreme gravity of a ball of super high density stuff, the pressure needed to hold the degenerate matter must be enormous. The counteracting electron pressure is caused by the momentum of the electrons heavily affected by the uncertainty principle, which is the prime characteristic of quantum physics. The uncertainty principle says that you can’t measure position accurately without creating uncertainty with momentum and vice versa. So, since objects in degenerate matter are very tightly packed, the position becomes very certain, but the momentum becomes extremely uncertain. Which means that there is a probability that collectively, momentum will be high enough to resist the strong gravitational force that threatens to collapse the matter. Now you can see why increasing temperature does nothing. The force involved is too great for temperature to increase electron pressure in degenerate matter. Also, at that scale, the uncertainty principle is the dominant factor at play. As you will see in a later post, even as electron degeneracy pressure fails, there will be a fail safe that particles will rely on to make sure the rules of quantum mechanics is respected. When even that fails, well, they commit the most dramatic suicide in the universe. At the point before 10 solar mass stars, though, electron degeneracy will prevail, and what remains after everything is over are hot corpses called white dwarves. These are extremely dense, exotic objects in which an object the size of planet Earth can have the mass of the sun, and it is what will remain after the end of these low massed stars. The circular arrows represent convective zones while the squiggly arrows represent the radiative zone. They represent the different ways in which energy moves outside. In radiative zone, light bounces around from atom to atom, taking on average over 170 thousand years to leave it. In the convection zone, the plasma moves by convection towards the top, being less dense due to the higher temperature at the bottom, and when it reaches the top, it releases the light energy. Now, notice how red dwarves, to the left of the diagram, consists almost entirely of convective zones? This means that even as the hydrogen is used up in its core, the convection ensures that fresh materials from the top reaches down to the bottom. Combined with having so much materials to work it, and the much slower pace of reaction compared to the more massive stars, red dwarves will get to live for trillions of years to come. Which means that the end of their lives has never been observed, and details on how they might die are mostly theoretical. Nevertheless, let’s speculate, shall we? Red dwarves, after their extraordinarily long lives, are theorized to die quietly. Like all stars, they will grow brighter. The lower massed ones won’t expand into a red giant due to it not being opaque enough. Instead, they will grow brighter and brighter and change colors and probably reach yellow to white. Eventually though, the hydrogen will run out and all that will remain is helium. Unlike all other star deaths, there will be no fireworks accompanying the fuel shortage. Red dwarves aren’t massive and hot enough to fuse helium into carbon, and due to how the convection mixes up the materials, there won’t be any hydrogen shell to fuse around the helium. The gravitational force will overcome the outward pressure and the star will compress into a helium white dwarf. Or at least that is what is believed the future of a red dwarf star is. The core that remains will shine extremely hot with ultraviolet, stripping off the electrons from the gas and causing the gas to glow. 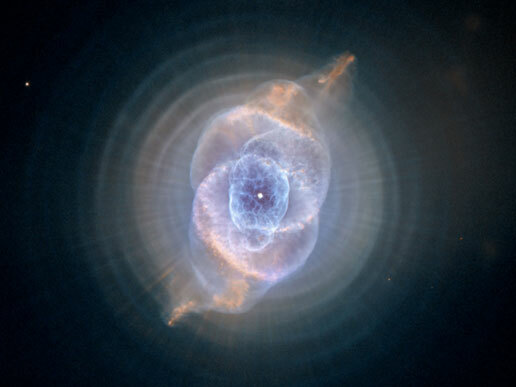 This is the so called “planetary nebula“. If it is going to go out, might as well die beautifully, right? Over time, the gas dissipates and all that will remain is the carbon/oxygen electron degenerate matter, the most common form of white dwarves. The stars with 8 to 10 solar masses will get the chance to fuse carbon and get an oxygen/neon/magnesium core. You might think that after this, there will be higher masses in which more opportunity to fuse atoms occur. Yes, they do, but in terms of electron degeneracy, this is where it stops. Even after the fusion stops and all that remains is the white dwarf, the star will keep shining on gloriously for a long time. Degenerate matter is a perfect conductor of heat, and the glowing you see is the heat stored in it. It starts out tens of thousands of degree hot and over time cools down. Eventually, the white dwarf will seize to be visible, and a very long time after that, stop emitting heat. Such an object, the black dwarf, does not exist yet because the universe is not old enough to have it cooled down, but it is the most likely outcome. Now, the electron degeneracy scenario might work for the stars less than 10 solar masses, but what happens to star around and above that? What happens when the core gets so massive that electron pressure is not enough to hold up the core? Will electrons get to occupy the same quantum state? No, as hinted previously, particles like electrons hate being in the same quantum state and it will do everything it can to avoid that. For these massive stars, the core collapse ending is what awaits them, and interestingly, the explosion of a white dwarf is possible through such a mechanism. This will be the subject of the next post. This planet is a wild one. The planet has been found to precess around 30 degrees in less than 11 years. Some of you may wonder what precession is. Well, basically it is the wobble of an object as it rotates. It happens to tops, and it does indeed happen on planet Earth too. There are various forms of precessions. The planet’s angle of rotation could change, which Kepler 413b does extremely quickly, and like the top, the axis of rotation itself could rotate in a circle. The planet Earth though, precesses so slowly that you need to wait thousands of years so you can even begin to see the change of the positions of the stars. Not in the case of this planet, wobbling without any stability. There are also the orbital kind of precessions. Before going further, you should be aware that all orbits are ellipses, with the center of mass at a focus. Meaning, the orbits are not perfect circles, more like ovals, and the center of mass is not in the perfect center of the oval, but offset by a specific mathematical amount to a place called the focus. This means that in the case of orbital precession, the shape of the oval rotates around the focus itself over a large period of time. Mercury is famous for having a large orbital precession, caused by a combination of the gravitational pull of other Solar System objects and the mechanics of general relativity (aka the most accurate theory of gravity yet) itself. The case of this planet is odd, though. When they first detected the planet by observing that the brightness of the star fell, signifying that the planet went in front of the star. They observed further cycles of the planet moving in front of the star. At one point, though, no object blocked the star’s light. And it kept going like this for many days until once again, they detected the same planet blocking the star’s light again and again. The significance of this discovery is compelling. It means the orbit is wobbling up and down, at times having the planet move in front of the star, at times above or below it. The combination of all those factors would make seasonal changes of this planet extreme and unpredictable. As for what could have cause this? At this point, any theory about what happened would be speculation. We just don’t have enough data. The link itself gives plausible scenarios, though. As for the physical characteristic itself, it is a gas giant. It is really close to its parent star, making its temperature very hot. It is 65 times the mass of the Earth, making it many times more massive than Neptune, but less massive than Saturn. While this goes in line with other gas giant discoveries, that its behavior deviates so much from what we have seen other planets do in their spin and orbit makes it a noteworthy object of study. You are currently browsing the IBY's Island Universe blog archives for February, 2014.